Top 5 malayalam movies of 2014 and box office hits details are given here. If you wish to know about the best malayalam movies and highest grossing box office hits so far, do read this article. With 81 movies released in six months, only six movies could make a good impression at the box office. Find here the top 5 malayalam movies and its performance at the theatres. Malayalam film industry which has already made its own space in the Indian cinema history is technically and artistically creamed with inventive brains. The technical brilliance shown by young filmmakers and novel approach made by the actors have given fame and name for the industry. The innovative transition happened during the past few years have put forward thoughts for positive and negative discussions. As social media has become more user popular and user friendly, the young educated movie goers keep a close eye of each movie and give their opinions at the right movement which can directly influence the filmmakers while his project is under production. While considering the number of movies released in 2014 during the first two quarters, the figure has exceeded comparing with the previous period. Out of 91 movies released in 2014 (81 malayalam, 10 dubbed), only 6 movies only could get the support of the spectators. Many big budget multi star projects were washed off while a couple of movies featuring comparatively young faces made with limited budget got overwhelming reception at the box office. As per report, there had been a loss of 150 crores which gives less chance for producers to invest money in new ventures. Around 50 – 70 movies made between the period of 2013 -14 is still unboxed due to non availability of satellite rights. Here is a precise analysis of the top 5 movies which made its presence alive in theatres. Bangalore Days, the first blockbuster of the year got a thunderous reception from the young moviegoers which were later supported by the family aduiance. Written and directed by Anjali Menon, the movie which featured an young cast of Dulquer Salmaan, Fahadh Faasil, Nivin Pauly, Nazriya Nazim, Parvathy Menon, Isha Talwar and Nithya Menen is making an impressive run in theatres. The movie has already completed 30 days in theatres and was released in more than 200 screens across India with subtitles. 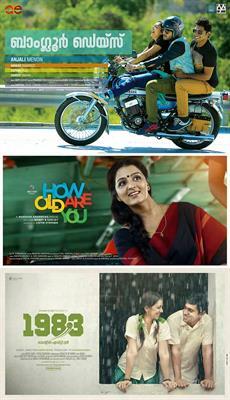 Bangalore Days managed to collect Rs 10 crores in its first week. How Old Are You which was celebrated as the comeback of actress Manju Warrier too emerged as the most grossing women oriented movie made in malayalam. Helmed by Rosshan Andrrews, the movie produced by Listin Stephen under the banner Magic Frames was greeted by the family audience after the mega blockbuster 'Drishyam'. After its 8500 plus shows, 'How Old Are You' have collected 12 Crores with its satellite rights sold for Rs 5.5 Crores. The movie '1983' which was released early in January purely creamed with the essence of love and passion has made an impressive performance in the box office. Directed by popular celebrity photographer Abrid Shine, '1983' is an example of realistic approach in film making. Produced by Shamsudeen, this film revolves around cricket and memories related to 1983, the year India won the world cup. Nivin Pauly, Anoop Menon and Nikki Galrani were the prominent actors. The movie completed 100 days with more than 7734 shows. '1983' could gather more than 10 crores from its 100 day runs in theatres both in Kerala and outside. Nivin Pauly, the golden boy of malayalam film industry had been credited with yet another hit. 'Ohm Shanthi Oshana' directed by debutant Jude Anthany Joseph proved to impress the movie enthusiasts for its innovative approach in film making. Produced by Alvin Antony with a budget of more than 5 Crore, the movie completed 110 days with 14100 plus shows. Ohm Shanthi Oshana' which featured Nivin Pauly and Nazriya Nazim in lead proved to be a box office hit and gathered more than 10 Crores from theatres. Prithviraj has proved his talent of selecting projects which could boost up his acting career. 7th Day, summer release directed by Syamdhar was a crime thriller which entertained the audience for its novel way of narrating the story and extra ordinary climax. The movie competed 65 days of run with 7500 shows. 7th Day movie made a gross collection of Rs 9.5 Crores while its satellite rights were sold for Rs 2.5 Crores. Dileep, the talented artist who has a magical power in drawing ladies and children to the theatres mesmerized the audience with 'Ring Master'. Directed by Rafi, the movie could gather 10 plus Crores while the satellite right was bagged by Asianet for a whooping price. 'Ring Master completed 75 days of its run with more than 12200 shows in theatres. With the Onam season approaching, a number of multi starrer projects are under preparation to entertain the fun loving audience. Peruchazhi, Raja Di Raja, Picket 43, Villali Veeran and Iyobinte Pusthakam are the high voltage projects which are currently taking procession to reach theatres during Onam. Best malayalam movies 2014 and top 5 highest grossing box office hits so far are given here. 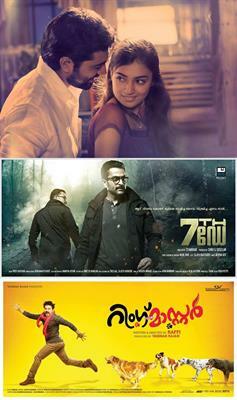 Top 5 malayalam movies of 2014 so far based on box office performance is analyzed in this article. With 81 movies released in six months, only six movies could make an impression in the box office. Read more to know about the performance of malayalam movies in 2014. Most anticipated malayalam movies of 2014 or the most awaited 10 malayalam movies of 2014 details are given here. With around 91 movies released during the first half of 2014, still more projects which are expected to clinch the hearts of the viewers are under preparation. Even though some of the most predicted and anticipated movies couldn't make much momentum in the theatres, a couple of movies made with limited budget emerged box office hits.